Rose gold is the trendiest metal of the moment. Why does everyone love rose gold? The blushing and flushing hue looks flattering on almost all skin tones, and the color is also a bit unexpected. Rose gold isn’t the standard yellow gold and it isn’t the clear crisp high-end platinum either. 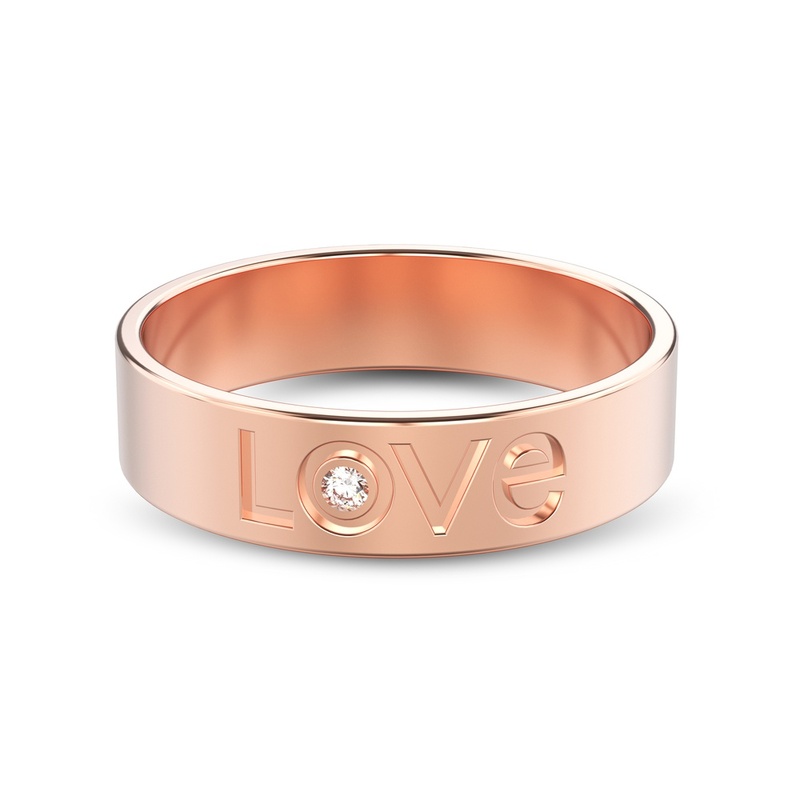 Rose gold symbolizes romance and nods to vintage; the metal is elegant, and, again, extremely en vogue. Rose gold illuminates phone cases, jewelry, and everything in between. Yes, you can even dye your hair rose gold! But this metal is ideal for a diamond wedding band. Rose gold diamond wedding bands can be paired with engagement rings set in any metal to create a romantic and beautiful wedding ring duo. But how do you design a rose gold diamond wedding band? Rose gold is an ideal setting choice for vintage-inspired wedding bands. Whether your style favors Edwardian or Victorian style jewelry, rose gold is the ideal choice to capture either period elegantly. To create a rose gold diamond wedding band influenced by the Victorian era, incorporate vines or leaves into the design. Dot diamonds along the leaves or add scrolling details. For Edwardian era inspiration, opt for floral or milgrain details. Use raised milgrain borders to accentuate diamonds within the band. Art Deco inspired wedding bands can also be designed in rose gold for a modern look. Art deco details might include diamonds that feature step facets like Asscher, baguette or emerald diamonds. Opt for crisp lines and sculptural shapes. Sleek and understated diamond wedding bands can be paired with any type of engagement ring. These diamond wedding bands often include infinity bands or a row of channel set diamonds. Your style dictates the carat size you select for diamonds. Infinity diamond wedding bands set in rose gold look beautiful with a seamless line of larger diamonds—and this can even add more carat weight to a sizable engagement solitaire. But smaller or more diminutive stones add an understated spark against any engagement ring. Don’t discount black diamonds for streamlined wedding bands, though. While white diamonds are the standard choice, a seamless row of black diamonds adds a sophisticated touch to the look. 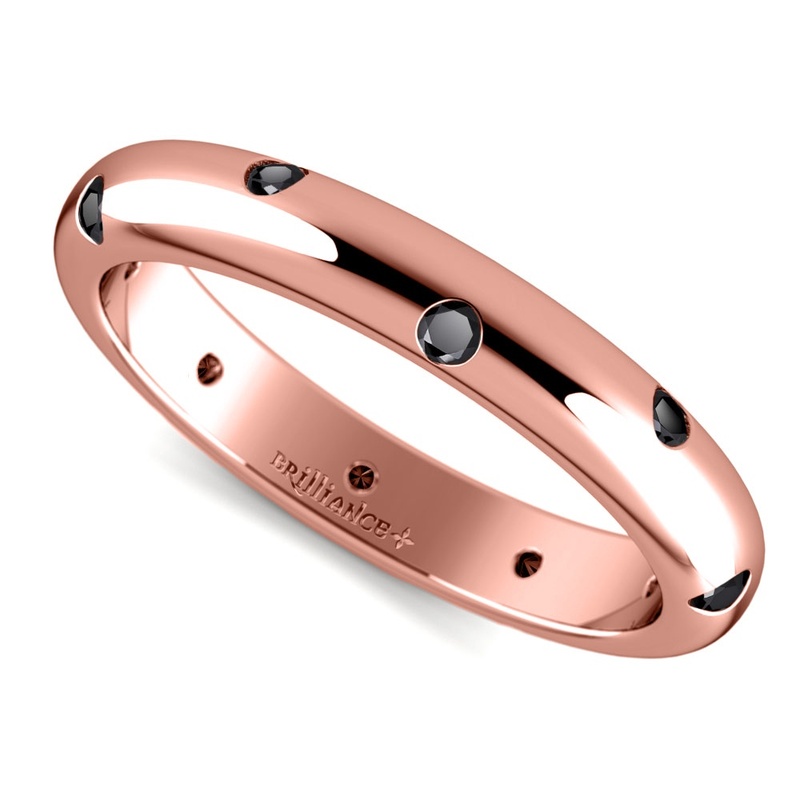 Place a central row of black diamonds within a rose gold band to draw the eye to the wedding set. When nudged against an engagement ring, a black diamond rose gold wedding band creates a contemporary contrast. And yes, you can also alternate black and white diamonds for a uniquely patterned rose gold diamond wedding band. While a channel set or pave set row of diamonds creates a beautiful and sparkling design, a single diamond set within a rose gold band complements a solitaire engagement ring. Pairing a solitaire wedding band with a solitaire engagement ring paints a partnership representative of the bonds of marriage. A solitaire diamond wedding band can also be worn alone. The look is simple, yet elegant. Choose a large diamond or a tiny stone. However, when selecting a larger carat diamond, set the stone within a band bezel style so that the diamond does not appear to be in competition with an engagement ring. Diamonds don’t need to be set in an orderly fashion. 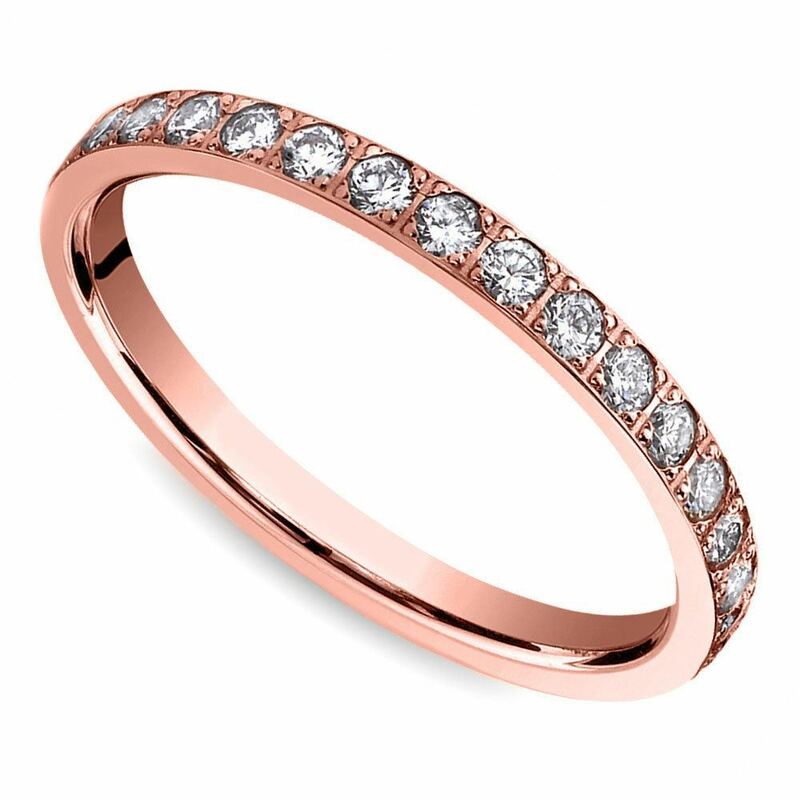 Choose a rose gold diamond wedding band that features inset diamonds scattered throughout the band. This design is a bit more whimsical, but very romantic. You can select either white diamonds or black diamonds to scatter around your ring. If you prefer larger diamonds, opt for a quintet. Five larger diamonds boost the carat weight of the wedding set and create brilliance. Each diamond should be about 1/10 of a carat. However, depending on your own preference, you can also opt for a larger carat weight. Stack rows of diamonds together for a massive amount of sparkle. When layering lines of diamonds, you should choose tiny stones to create the look of a block of brilliance. Pave settings also add in peeks of metal prongs to give texture and contrast to the band. Rose gold diamond wedding bands can be shaped and weaved into patterns. 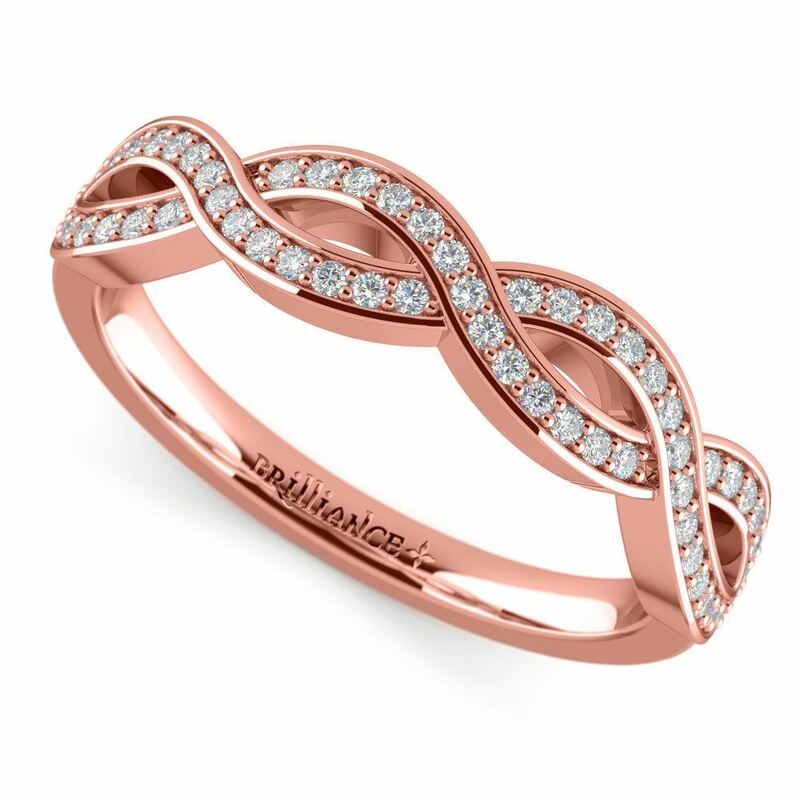 A swirl pattern features arcs of diamonds for a romantic styling that resembles an infinity symbol. 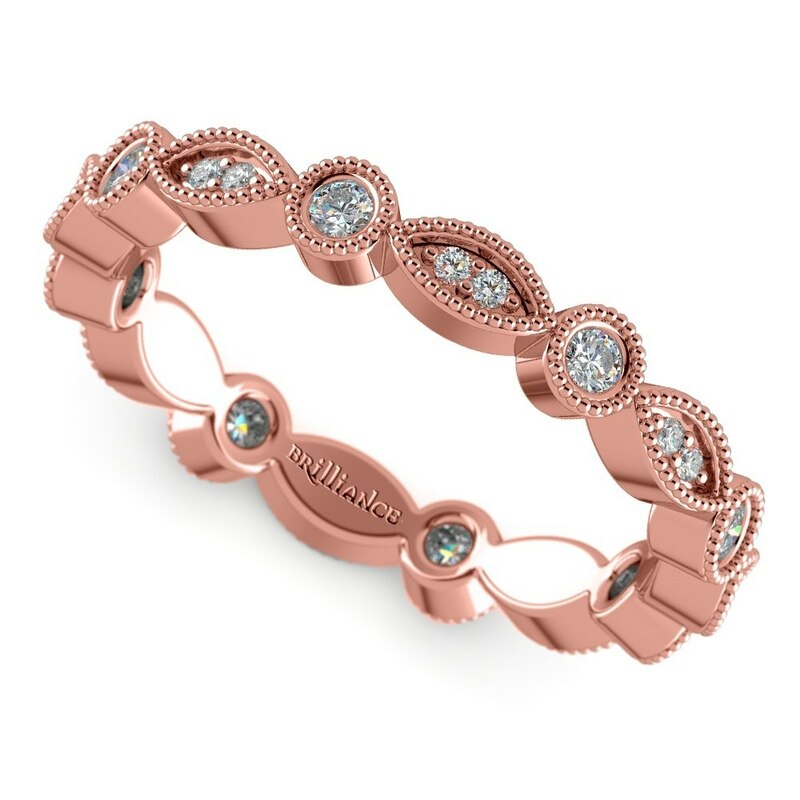 You can also design your rose gold band with ribbons of diamonds that tie up the look with a sweet sentiment. Some brides opt to only wear a wedding band and say ‘no’ to an engagement ring. If your wedding band will be your only ring, then consider bolder carat bands. Of course, you can choose a larger carat band to wear against your engagement ring—there are no rules! Eternity diamond wedding bands can include any shape of diamond, including Asscher and round brilliant diamonds. If you don’t see the diamond shape you like, you can choose to customize your band. Knife-edge wedding bands can include stones on the top and bottom of the band. This unique design features an angular edge that shows off two sides of the band. Drop white diamonds along the top and bottom or you can include a row of colorful gemstones or black diamonds, too. 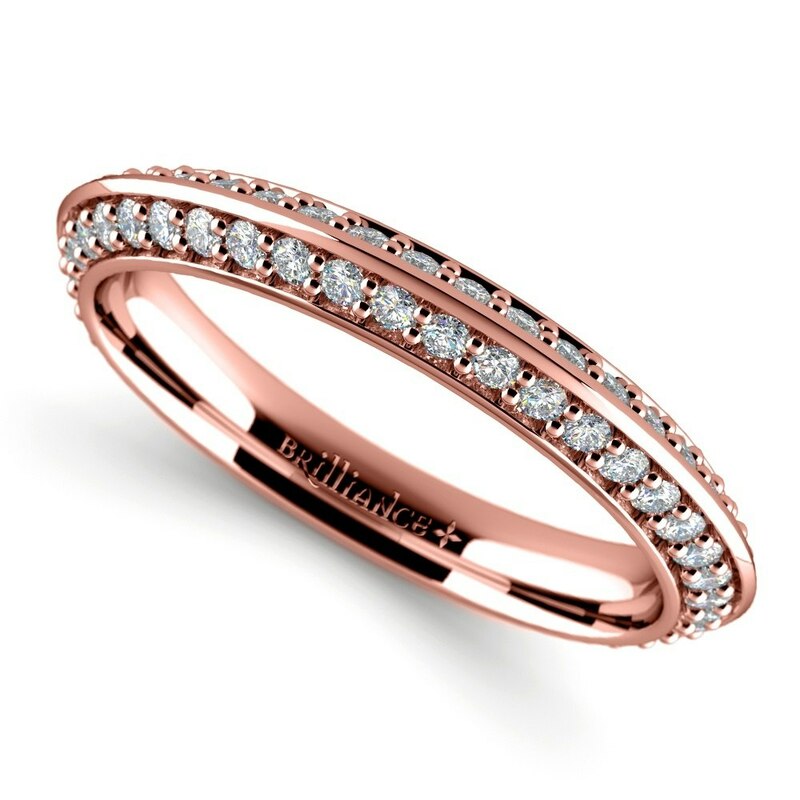 Rose gold diamond wedding bands don’t have to just feature diamonds. Mix in a birthstone or just a favorite hue of colored gemstones. Pearls may add a touch of vintage romance to any design. Of course, colored diamonds are also an option. 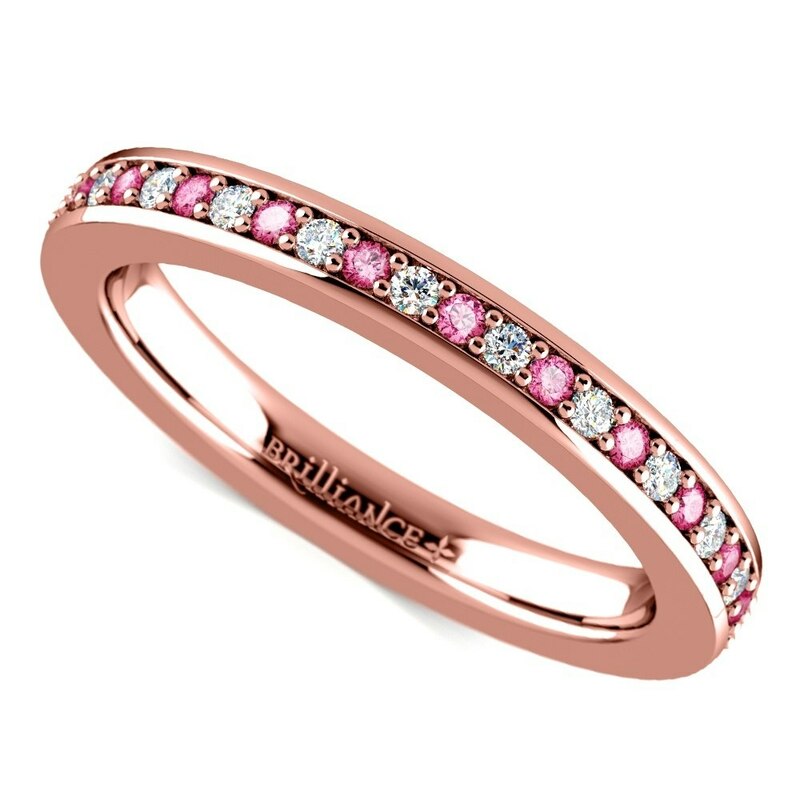 Pink diamonds accentuate the pink undertones of rose gold. Stay away from champagne or canary yellow diamonds as they often clash with the blush of the rose. Some diamond wedding bands are designed to hug and frame an engagement ring. These are called wrap rings, and they add a beautiful border of diamonds to any diamond or gemstone engagement ring. This type of ring includes two bands that are joined by metal bars. The ring is meant to slide over an engagement ring to create an amazing—and dazzling—wedding set. 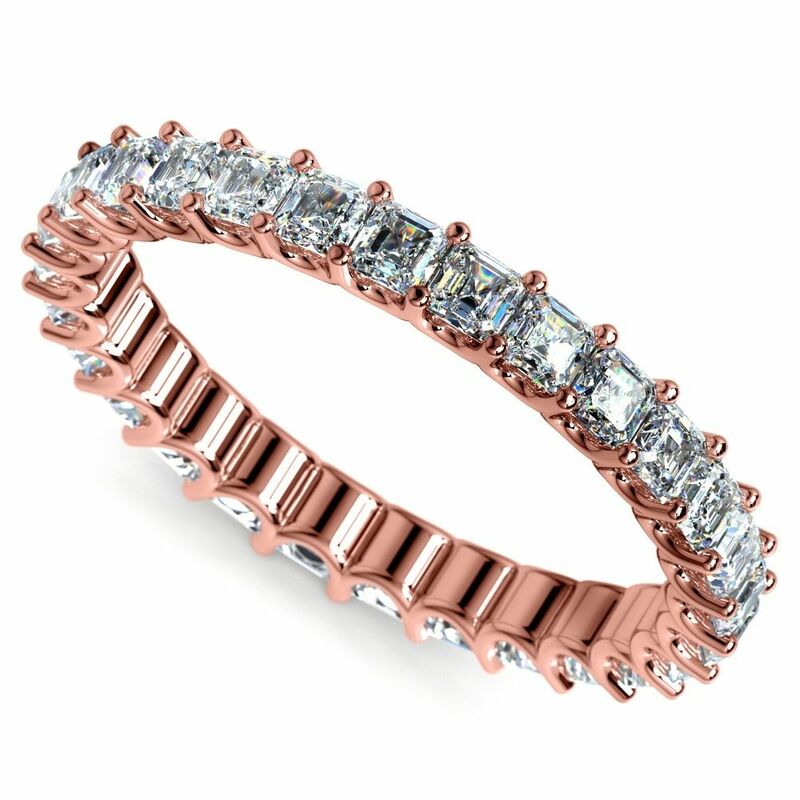 Rose gold diamond wedding bands are definitely a romantic choice to symbolize your vows. Rose gold is the on-trend metal of the moment, and it looks beautiful styled with vintage inspiration or in more modern settings. 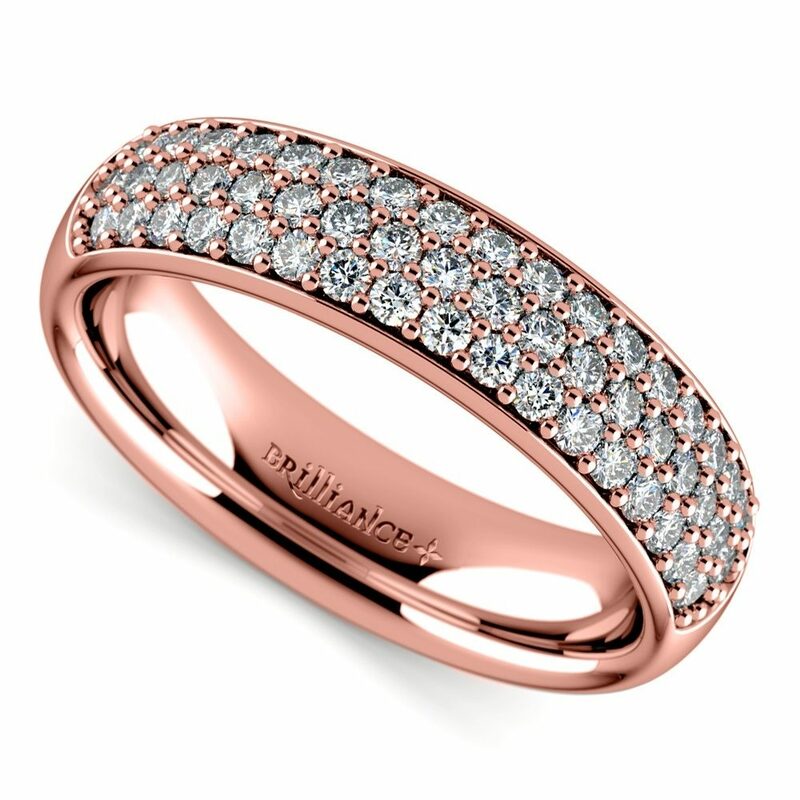 Whether you want big, bold diamonds or smaller sparklers, there is a rose gold diamond wedding band for you!